The organist composers of the North German organ school were among the most revered musicians of their time. They played a key role in the music life of the towns in northern Germany, such as Hamburg, Lübeck, Lüneburg and Stralsund. Heinrich Scheidemann is generally considered the founder of the North German organ school, but his compositions are probably less well-known than those of other representatives of that school. Scheidemann was born in Wöhrden in Holstein, where his father David was organist. Around 1604 the family moved to Hamburg, where David was appointed organist of St Katharinen. From 1611 to 1614 Heinrich studied with Jan Pieterszoon Sweelinck in Amsterdam. The latter dedicated a canon to his pupil, when Scheidemann returned home. He took over his father's position in 1629 at the latest; from that it is assumed that 1629 was also the year his father died. He held his position until 1663, when he died of the plague. It is not easy to decide how large Scheidemann's extant oeuvre is. The work list in New Grove includes various compositions under the header "anon., probably by Scheidemann". Not on that list is Gelobet seist du, Jesu Christ, which has been preserved anonymously. In addition there are a handful of pieces, which are marked as "doubtful". As is quite common in the case of organ music of the 17th century, only two pieces have been preserved in autograph. All the other pieces have come down to us in copies by pupils and colleagues. New Grove states: "Of Sweelinck's many well-known north German pupils, it is Scheidemann whose organ music survives in the largest number of sources." This tells us much about his reputation. The present disc includes the complete preludes, known under two different titles: praeambulum and praeludium. These are rather short pieces, and are mostly of an improvisatory character. Such pieces were originally intended to establish the key of a vocal work to be sung, either by the congregation, or – more likely – by the choir. They are quite different in character. In some, the various voices have much independence, which sometimes results in strong dissonances, especially if some of the voices include chromaticism. The most marked example is the Praeambulum in d minor (WV 34), the only piece in Scheidemann's oeuvre that is dated: 1637. Other pieces are largely built up from chord blocks, from which now and then one of the voices derives to play a phrase of its own. Many pieces comprise several sections, which allows for variety within a piece, for instance the inclusion of a section with imitation between the voices. The preludes take the first half of this disc. Next follow some of Scheidemann's arrangements of chorales. There are two types: the large chorale fantasias which were to become one of the hallmarks of the virtuosic North-German organ style, and smaller-scale chorale arrangements. The pieces included here are of the latter category. The two-section Gelobet seis du, Jesu Christ, mentioned above, is attributed to Scheidemann for stylistic reasons. In the first section, the cantus firmus is in the bass, with only slight ornamentation; in the second section, the ornamentation of the cantus firmus in the upper voice is more extended. In Gott sei gelobet und gebenedeiet, the chorale melody is in the bass, and in Komm, heiliger Geist, Herre Gott – in soprano and bass, the former ornamented and the latter in long notes. Jesu, du wollst uns weisen, one of Scheidemann's best-known pieces, is an arrangement of a chorale, which is an adaptation of a secular piece by the Italian composer Gastoldi. The most extended ornamentation of the chorale melody appears in Nun bitten wir den heiligen Geist and Vater unser im Himmelreich. The Kyrie dominicale is an example of a piece for the alternatim practice. This is a part of the repertoire of the North German organ school which has received relatively little attention. If such pieces are played, they mostly come without the vocal sections. That is the case here as well. It would be nice if someone would try to perform a kind of reconstruction of such pieces, with the appropriate plainchant. For the third and last section of the programme, Flamme returns to the free organ works. These come in forms which were very common at the time, in Germany as well as in Italy, whose stylus phantasticus was one of the sources of inspiration of the North German organ school. The canzona is, as the name suggests, based on vocal models. The Canzona in F comprises three sections, each in the form of a fugue. The two fugues in d minor are both divided into several sections, in which the subject and countersubjects are arranged and combined in several ways. The toccata was one of the main forms of the North German organ school. Toccatas would develop into large-scale pieces of several sections, including a fugue. The Toccata in C is relatively modest; here the second section is a fugue, whereas the closing third has the form of a bicinium. 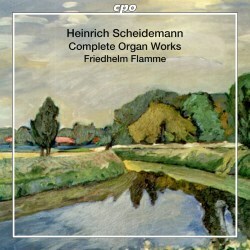 The disc ends with one of Scheidemann's largest free organ works. In the Toccata in G the influence of Sweelinck manifests itself, especially through the use of the echo technique. It is intended for two manuals, and the whole compass of the keyboard is explored. I do not know whether a further recording of Scheidemann's organ works is planned. It is to be hoped, because despite his status as the founder of the North German organ school, the catalogue includes only one complete recording (Naxos), and most organists play the same pieces. This disc is definitely a major addition to the catalogue. As in previous volumes in this series, Flamme is a competent guide through this repertoire. However, in previous reviews I have expressed some reservations in regard to his interpretations, and that is not any different this time. His phrasing and articulation are all right; the registration is largely a matter of personal choice, with which one can agree or not. The organ seems to be suitable for Scheidemann's music, and especially the "modified meantone temperament", as it is called, is appropriate here. As a result, the dissonance in pieces with chromaticism comes off to full effect. My main problem is that Flamme's performance often does not really breathe. I would like to hear a more 'vocal' style of playing, with more breathing space, which would also result in some notes or chords getting more weight. The Praeambulum III in d minor (WV 33), one of Scheidemann's best-known preludes, is a good example. The tempo seems just a little too fast. The same goes for Jesu, du wollst uns weisen, which I find a bit superficial. That said, if you love North German organ music of the 17th century, you should not miss this disc. It shows the qualities of a figure whose importance cannot be overstated.